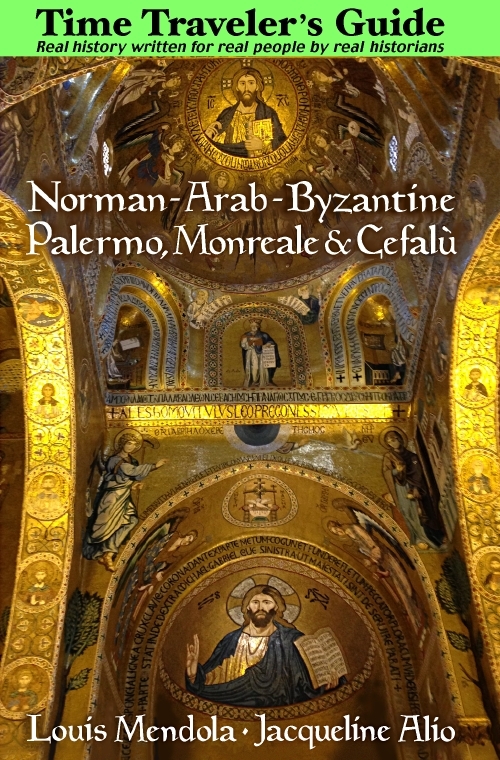 Castles and Palaces in Palermo - See Palermo and Western Sicily. The Norman Palace is described on its own page. Our "tour" of Palermitan palaces and castles begins with the Zisa and Cuba, both of the Norman era. The Zisa: The Zisa (shown here) is a 12th century palace constructed towards the end of the Norman reign when the Norman-Arab style of architecture had reached the peak of its development and sophistication. The name "Zisa" is the Sicilian for the Arabic "Al-Azizah," meaning "The Splendid." (The phrase survives in the Sicilian phrase "azzizatu," meaning "well-dressed.") This beautiful Norman palace certainly merits its name. In the twelfth century, the Zisa was the main building of a royal park which also included the Cuba and the Cubola. This park was rather extensive, stretching at least one kilometer from the Zisa to the Cuba. In those days, this area was open land just outside the city gates. Today, the area where the park once stood is the lower Corso Calatafimi or Mezzo Monreale zone of Palermo. The park was known as the "Genoard," a Normanc interpretation of the Arabic phrase "Jah'nat al-Ard," for "Terrestrial Paradise." The construction of the Zisa was begun in 1166 by King William I, who died that same year. The Genoard park was famous throughout Europe in the Middle Ages. Its splendid gardens were known to the writer Boccacio in the 13th century; one of the stories in his famous "Decameron" is set in the Genoard. Sources attest that in the heyday of the Norman monarchy, the park was fenced in so that wild animals could roam within. Fishponds and cages with exotic birds were scattered about the grounds amidst unusual flora and lush gardens. Artificial streams separated the various attractions on small islets connected by little bridges so that the King and his guests wouldn't get their feet wet as they strolled about. There were apparently several pavilions similar to the Cubola in the Genoard, but they fell into decay or were destroyed in the seventeenth century when the road that is now Corso Calatafimi was built. However, it seems that the Genoard was still more or less intact as late as 1575, when people seeking to escape the Plague sought refuge in the fresh air and natural surroundings found here. 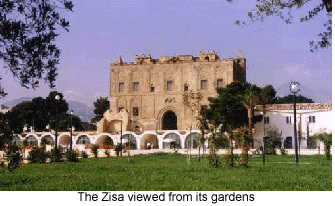 The Zisa is a rectangular building with two towers set midway along sides of the structure. The shorter sides (north and south walls) are about 25 meters long. The west and east walls of the palace are about 50 meters long, with the east wall serving as the main entrance and facade. The Zisa is about 30 meters high, with a series of small parapets around the roof. Though these parapets are not part of the original construction, having been added in the fifteenth century, they don't detract from the medieval aspect of the edifice. The Zisa has three stories. The front facade of the Zisa has three arches, the more elaborate central arch is the main entrance. An inner archway leads into the central main room of the Zisa, called "The Fountain Room." Each of the main arches is supported by a twin marble column. With the exception of the arches, the exterior of the Zisa is not particularly remarkable. The ruins of what was either a fountain or a fish-pond are located in front of the main entrance. The "Fountain Room," the Zisa's main room or reception area, takes up two stories of the castle. Smaller rooms on the upper floors were most likely private chambers and guest rooms. Since the Fountain Room served as the main hall of the palace, it was, naturally, more elaborately decorated than other rooms in the Zisa. The niches in the Fountain Room, along with some other rooms, are decorated with "muqarras." These are Arabic stalactite roof vaultings, splendidly and elaborately sculpted. The Zisa's interior is much more ornately decorated than its exterior, and rather resembles a sultan's palace. One of the more interesting of the palace's displays is Anna's Tombstone. The stone is divided into four separate sections by an inlaid polychrome mosaic cross placed across its front. Each of the four sections bears Anna's epitaph in a different language: Hebrew, Greek, Arabic and Latin. The stone is located in a room in the left-wing of the second floor. There are several Turkish "mushrawbiya" from the thirteenth century. These are intricately carved wooden screens, designed to keep out the heat and let in the sunlight. The Turkish screens displayed in the Zisa are believed to closely resemble the Arabic screens used in the Norman era in Sicily, of which none are known to exist. There are also quite a few examples of twelfth century ceramics displayed. In the right-wing of the second floor, there is a display which features an intricately-worked bronze wash-basin of thirteenth century Syrian craftsmanship, a fine example of medieval Saracen metalwork. The Cuba: Located on Corso Calatafimi (in the Tukory barracks opposite Via Quarto dei Mille), the Cuba may be characterized as a less elaborate version of the Zisa, and it is not as well preserved. "Cuba" is the Sicilian derivation of the Arabic "Ka'aba," referring to a cube or square-shaped structure. It was built in 1180 by King William II to serve as a kind of summer-palace and main building of the royal gardens. The Cuba is about 30 meters long and 15 meters wide, with a height of about 20 meters. The building presently has no roof, and scholars disagree as to whether the Cuba once had a roof or dome that no longer exists, or whether it was built without a covering to give it an open-air effect. The Cuba epitomizes the classic style that so permeates twelfth century century Sicilian architecture. In the center of the Cuba there are remains of what possibly might have been e a fountain. There is a nook which has a semi-broken arch upon which there are inscriptions written in Arabic. The building is big enough to have accomodated a hundred people for a feast. Palazzo Abatellis: Built in the 1490s in the Catalonian Gothic style, Palazzo Abatellis is an interesting structure of sweeping arches, featuring an embattled tower and details such as medieval-style waterspouts (gargoyles). From the outside, it looks like a castle. 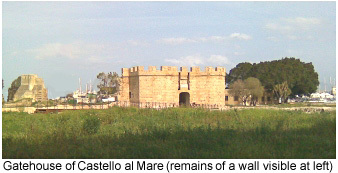 In fact, it is one of the last semi-fortified aristocratic dwellings built in western Sicily. 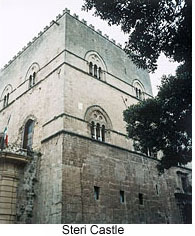 Located on Via Alloro in Palermo's Kalsa district (a seaside park is visible at the end of the street), the building seems slightly more Romanesque than Gothic, and certain parts of it have been "restored" beyond recognition, with ugly stucco walls concealing natural stone. It's still impressive. What is more important is its art collection, considered one of Sicily's better ones. But would visitors be disappointed? Outside the world's largest cities, it is usually presumed that smaller art galleries focus their claim to fame on a few masterpieces. Palazzo Abatellis has its share of these, but the general collection may be a little overrated, at least to those of us familiar with art collections elsewhere. Most of the Abatellis collection is Late Medieval and Baroque. Castello al Mare: Rrecently restored, parts of "Castle-by-the-Sea," at the end of Via Cavour near the shore, can be seen from a distance across the Cala bay if you're standing at the entrance portico of the church of Santa Maria della Catena near Porta Felice (Corso Vittorio Emanuele off Piazza Marina). The site is often open to the public. Most of the fortress has been destroyed but a gatehouse, some walls, the moat and lower portions of a large circular tower remain. Parts of this seaside castle (now farther inland) were constructed during the Arab period. The structure was expanded by the Normans in the twelfth century and by the Swabians in the thirteenth, but largely torn down between 1860 and 1923. Although a visit to Castello al Mare may be of interest only to the pure medievalist, the structure (and its small garden) lends a nice atmosphere to this corner of the city.